Tailyn Dailey was born 2 weeks early and spent 222 days in the NICU (with heart defects, respiratory failure and cleft lip and palate), including her first Christmas. 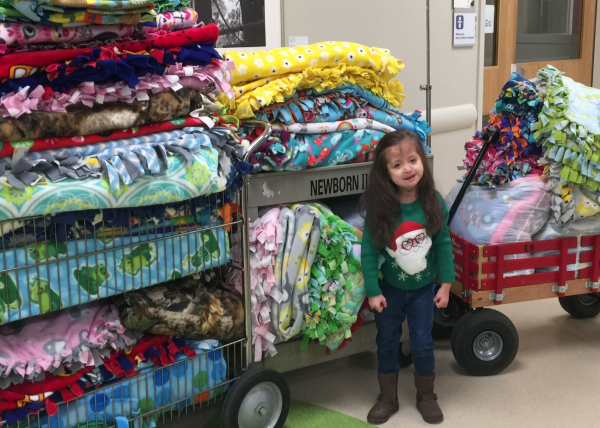 This year, her family donated 80 blankets and the inspiration of their story below to provide hope to families currently in the NICU. I’m sure you were not expecting to spend the holidays in hospital with your newborn child. The life of the NICU (Neonatal Intensive Care) can be challenging, stressful and most of all scary. We would like to share our story with you – Tailyn’s journey – with hope that it may help your family. My husband, Brent, and I were in our home town hospital ready to delivery our first child on Nov. 11, 2011. When Tailyn was born at 4 p.m. that day I could tell something was wrong – she was not crying after a period of time. The nurses told us Tailyn only weighed 3lbs. and 14oz. and was only 17 inches long. They also told us that Tailyn was born with a cleft lip/palate, was not breathing and had low oxygen levels. They immediately called Akron Children’s AirBear (pediatric medical transport helicopter) to come and get her. Brent and my parents followed her to Akron. It was a scary sight for them to see. The medical team surrounded her trying to figure out what was going on and why she was wasn’t breathing properly. After hours they told my husband and parents they needed to wait for testing to come back, but at that time she was breathing fine with the help of a little bit of oxygen. She also needed an NG feeding tube because of the cleft lip/palate. Tailyn at about 1.5 years old. Each day she made improvements, but when she was 19 days old, I got a call at the Ronald McDonald House that Tailyn quit breathing. I rushed across the street as fast as I could. The doctor was waiting for me. She said Tailyn quit breathing because her tongue was falling back on her airway. It didn’t grow properly. The only way to fix the issue was to get a tracheotomy tube and be on a ventilator. She had surgery that day. As first time parents, we were terrified. 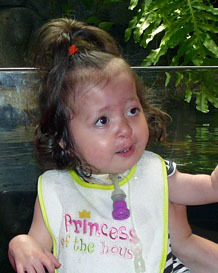 After trach surgery, Tailyn was paralyzed for 7 days, which meant we couldn’t touch or hold her. Only the nurses were allowed. 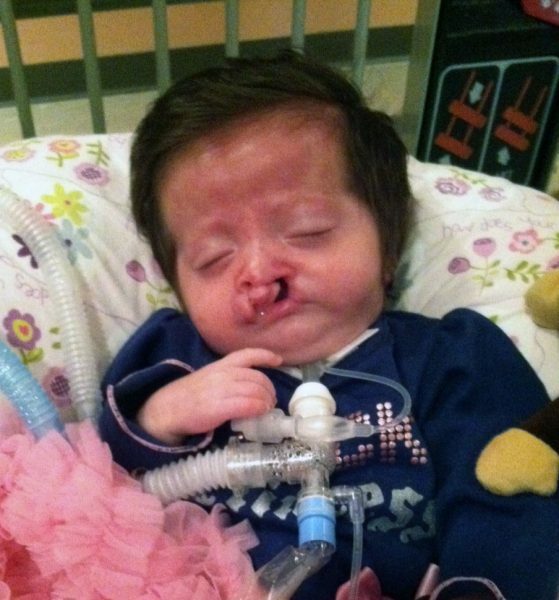 When it came time to start weaning her off the ventilator, she failed the test. We went through a lot of heartache. It seemed like everything was falling apart. The respiratory team got involved and explained that we would have to go through training to take Tailyn home on a ventilator. Weeks went by and there were really no changes except for learning how to take a baby home with trach and vent. I’m not going to lie – training was scary and very hard, at first, but we got through it and every experience was memorable and rewarding. After Christmas Tailyn got a G-Tube (feeding tube); it was another necessary step before we could go home. The doctors met every day for rounds, and I finally got the nerve to ask them, “What is our plan?” Their response was: Tailyn has to grow, so more or less, it was a waiting game. Tailyn needed to weigh around 10 lbs for the home ventilator. She was only 5 lbs. at that time. So, we waited. 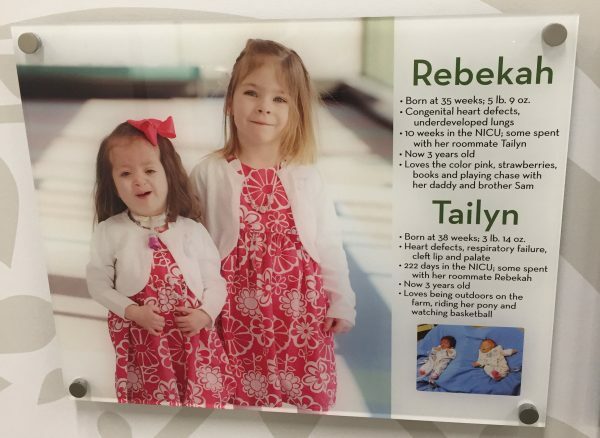 Tailyn is featured on the NICU Wall of Hope with her roommate Rebekah Plant. The families said they will be life-long friends. As the wait grew longer and the stress of being there was growing too, I asked to meet with a plastic surgeon for a consult on her cleft. We met with Dr. Ananth Murthy. He was so helpful, and we decided as a team to go ahead and do surgery. The first surgery was scheduled for March 6. Tailyn also on that date had ear tubes placed by an ENT (Ear, Nose & Throat Center) doctor. Tailyn had a long, very painful recovery from surgery, but it was rewarding to us at the same time. Time went on and FINALLY Tailyn reached 10 lbs. on April 1. The very next day they tried her on a home ventilator and it was a SUCCESS. So for us that meant learning to understand the home ventilator. Finally on June 18, we got to go home! She was 7 months old. Our journey of being at home had up and downs as well. Tailyn had 16 hours of physical, occupational and speech therapies and nursing care. She had more surgeries, and many follow-up doctor appointments and clinic visits. 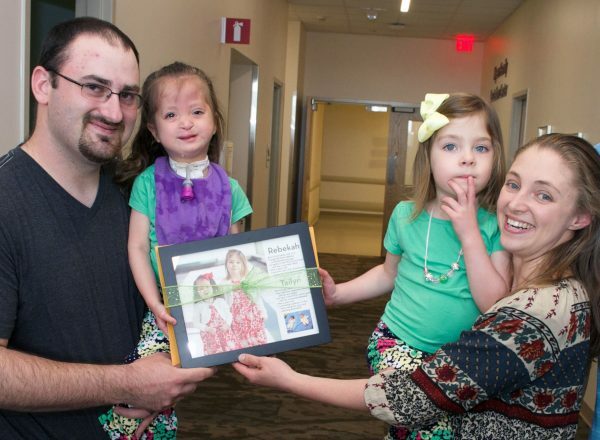 In 2015, Tailyn and her dad Brent attended the Wall of Hope dedication ceremony; they are pictured with Sarah and Bekah Plant. As years went by, the doctors slowly weaned her of the ventilator. Then they started the capping process which means plugging the trach off and learning to breathe out of her mouth and nose. In August of 2015, at nearly 4-years-old, Tailyn was successfully weaned off the ventilator completely. On July 29, 2016, Tailyn underwent her 17th surgery to remove the tracheotomy tube. WOW – we never thought that day would ever come! Now, almost to Christmas, and we received the best present by getting her stoma closed on Dec. 23, 2016. Our life is starting to be normal now. Tailyn just turned 5. Our journey in the NICU was great. It was a scary experience but it was rewarding – we got our miracle baby! Use this gift to remember our story, and your journey in the NICU. We feel that the NICU will always be a part of our life. The nurses and doctors were our family. You will miss them when you leave – I know that seems crazy. Why would you miss them in such a scary time? Trust me, you will.